Lemon curd makes me think of sunny spring days and this combination of lemons and dried lavender blossoms creates a headily fragrant spread so buttery, so citrussy and rich tasting that you’ll want to spread it onto everything. I recommend a warm croissant, toasted brioche or *scone (*what we Brits refer to your ‘biscuits’ over here). You can fold lemon curd into equal amounts of whipped cream for an extra special cake filling or as a topping for pies, fruit, etc – and I plan to make a tart with lavender lemon curd and blackberries – recipe coming soon. Lemon curd, with or without the lavender, is incredibly easy to make and will keep in sterilized jars for 10 days in the fridge. This recipe makes enough for two jars; one to keep and one to give away if you can bear to part with it. I used Meyer lemons as they’re plentiful right now but any lemon will do. Finely grate then chop the zest from the lemons and squeeze out all the juice. Start by melting the butter with the sugar in a large bowl over a pan of barely simmering water, then add everything else. Whisk gently until smooth and thick – this can take about 15-20 minutes. Strain the lemon curd through a sieve into a clean bowl then transfer it to two sterilized jars and allow to cool before securing the lids. Keep the lemon curd in the fridge and eat it within about 10 days…although I can’t imagine that would be too challenging. This entry was posted in Desserts, Gluten Free Desserts, Sauces, Preserves, Condiments. Bookmark the permalink. 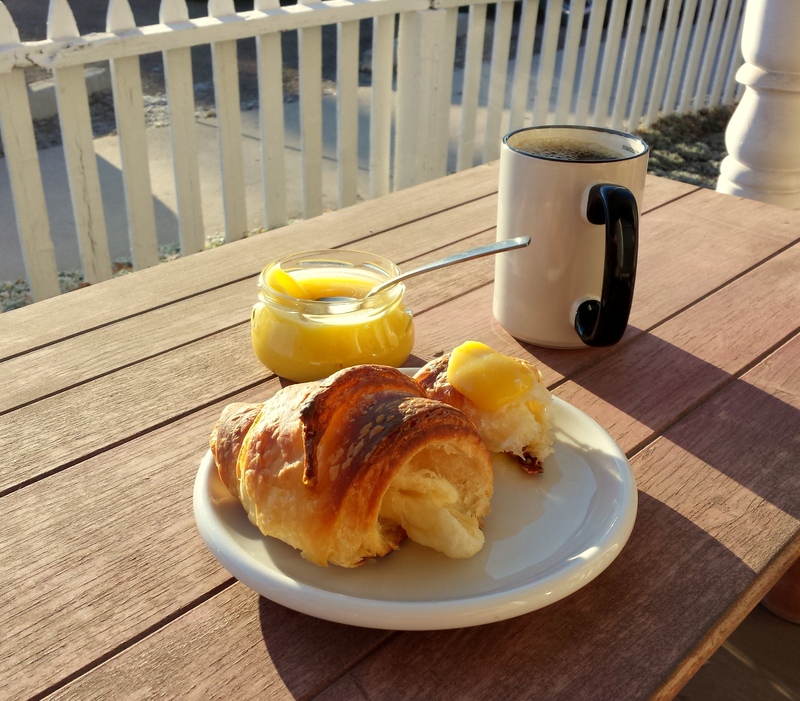 Jackie’s rich luscious lemon curd on a buttery croissant with a fresh cup of French roast on the front porch of a 130 year old Victorian – the perfect way to begin a glorious morning in the Colorado Rockies! Thanks Jackie!